182 x 132 mm. – 261 leaves, 11 with large painted initials on gold, 9 of which historiated with a figure or a scene with text scrolls. f. Feast of St. Elisabeth: initial L, with St. Elisabeth and the patron-bishop (without mitre) kneeling in prayer. In the left margin: a disabled beggar kneels in prayer. To the right: three deacons hold a mitre, crozier, and book to offer to the bishop before Elisabeth. In the lower right margin: the Von Hessen coat of arms. This breviary was recently discovered in a private collection. The coat of arms identifies the patron as Archbishop Hermann von Hessen of Cologne. His breviary – even though incomplete – is a major new document to the history of Cologne, of its art, religion, and of the personal identity of one of its important ecclesiastic leaders. This codex comes down to us from the time when Cologne retained its place as the first city of the Holy Roman Empire, in which learning and arts were cultivated. The large initials, colourful miniatures, and decorated borders of this Breviary illustrate the vitality of Cologne manuscript painting of the last decades of the 15th century. The selected themes for illumination fit to the importance of the feasts and depict quite literally the contents of the text it accompanies. The group of manuscripts known for the ‘goldrispen’ style of border decoration, known in Cologne since the 1450s-1460s and present in this manuscript, often also contain pen-flourishes in red ink with marked flowers and the similarly painted ‘christmasballs’. 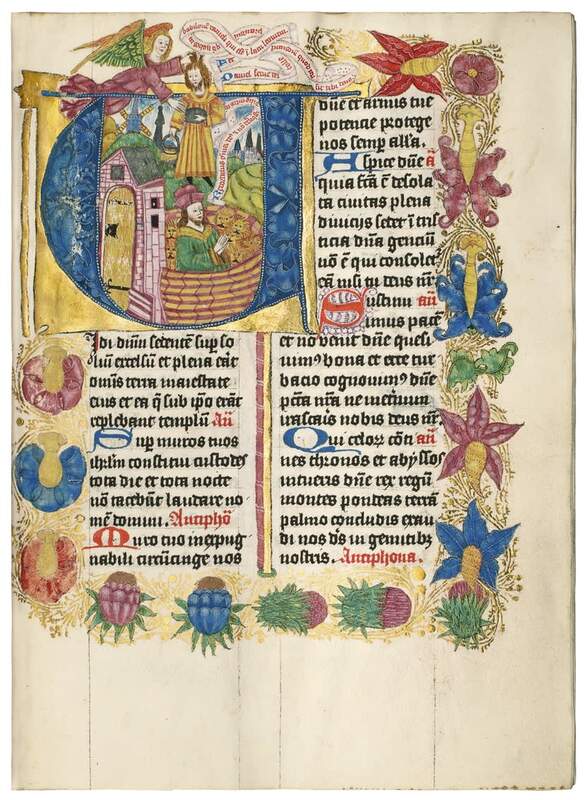 The present manuscript is an important witness of this type of Cologne illumination from the 1480s. The colourful, somewhat naïf but surprising and lively miniatures, as well as the circumstances of the important patron, make this book not only a hallmark of Cologne’s late 15th century manuscript production but of Hesse family history as well. As administrator of the diocese of Cologne, Hermann von Hessen (1449-1508), son of the Landgraf of Hesse, became known for his heroic defence of the city of Neuss against the Burgundians (1474-1475). That this long lost Breviary, a work of great artistic and historical value, has returned to the public again, is quite exceptional. This work is now in the collection of the Historisches Archiv in Cologne.